Image courtesy of Ellis County Historical Society. In Republican–controlled, predominantly Protestant, and traditionally oriented northwestern Kansas, Kathryn O’Loughlin McCarthy was an unusual politician: a Democrat, a Catholic, and a single woman. But her political roots, connection with farmers and cattlemen devastated by the Great Depression, and a strong Democratic tide in the 1932 elections helped her win election to the U.S. House of Representatives. The daughter of John O’Loughlin, a Kansas state representative and cattleman, and Mary E. O’Loughlin, Kathryn Ellen O’Loughlin was born on April 24, 1894, in Hays, Kansas. She grew up on the family ranch and remembered a childhood shaped by farm chores—feeding livestock, milking cows, and familiarizing herself with the latest farm equipment.1 She graduated from Hays High School in 1913 and, four years later, received a B.S. degree in education from the State Teacher’s College in Hays. After she received a University of Chicago LL.D. in 1920, she passed the Kansas and Illinois bar exams.2 O’Loughlin began positioning herself for a career in elective office. She returned briefly to Kansas and served as a clerk for the Kansas house of representatives’ judiciary committee while John O’Loughlin was a member of the legislature. “Sometimes I could hardly sit still at the debates,” she recalled. “I wanted to get in there and argue, too.”3 O’Loughlin returned to Chicago, where she participated in legal aid and social welfare work. In 1929, she resettled in Kansas and, a year later, was elected to the state legislature. From the beginning, Congresswoman Kathryn O’Loughlin McCarthy faced an almost insuperable obstacle to re–election when House leaders rejected her appeal for a seat on the Agriculture Committee and instead assigned her to the Committee on Insular Affairs—in charge of U.S. overseas territories. “Where, pray tell, are the islands of Kansas?” she protested.7 Outraged, she demanded an assignment more useful to her constituents. Her challenge caught House leaders off guard. Contending with an avalanche of freshman Democrats elected from traditionally Republican districts, they denied her request for an Agriculture seat. The decision disappointed farm constituents, who had hoped to have a stronger voice in federal projects for the state. Instead, McCarthy was reassigned to the Education Committee. She also received posts on the Public Buildings and Grounds and the World War Veterans’ Legislation committees. The repeal of Prohibition was one of the first issues McCarthy confronted. Long–standing Kansan support for temperance conflicted with the needs of the state’s cash–strapped wheat and barley farmers— shaping her middling position. The issue was contentious in a state that had produced Carry Nation, a petite grandmotherly figure who had led the militant forefront of the Prohibition movement at the turn of the century. Her “Home Defenders” network of temperance zealots descended on saloons in Wichita, Topeka, and other Kansas towns, smashing them up with canes, bricks, and stones in a series of attacks that became known as “hatchetations.” Against this backdrop, McCarthy steered her course. Her home county permitted the production of alcoholic beverages, but not all the counties in her district did. Shortly after her election she pledged to modify the 18th Amendment to allow “wet” states to have liquor if states that wished to prohibit alcohol were still protected. In her largely agricultural district, grain growers insisted that the alcohol market could generate revenue for devastated farming operations. Many Kansans, including some former temperance advocates, agreed the 18th Amendment should be relaxed.8 When the Cullen Beer Bill, which legalized beer production, advertising, and distribution, overwhelmingly passed the House on March 14, 1933, however, McCarthy joined her six Kansas colleagues to vote against the measure.9 “You may expect me to be an ardent supporter of this bill; but I think this bill is premature, will not accomplish its purpose, and will not raise the revenue desired,” she explained. “It is a discrimination in favor of big business… I do not think all the home–brewers in my county could raise the $1,000 license fee.”10 Later in 1933, the 21st Amendment repealed Prohibition altogether. McCarthy zeroed in on the needs of her farm constituents. She recommended extending experimental Agricultural Department programs to promote better “dry land” farming practices: crop rotation, soil erosion prevention, water conservation, and summer fallowing.13 In arguing on behalf of low interest rates for direct credits authorized under the 1933 Farm Bill, better known as the Agricultural Adjustment Act (AAA), she blasted bankers and business interests as the root cause of agricultural economic collapse. “If we had not had the high protective–tariff rates which compelled the farmer to buy everything he used in a protected market and to sell everything he produced in a world market, he would not be in the condition he is in today,” she said to applause on the House Floor.14 McCarthy fervently supported the AAA, which she believed would bring relief to farmers through a combination of federal loans, parity pricing, and quota restrictions on basic farm commodities. In 1934, McCarthy introduced bills setting compulsory caps for wheat production and taxing extra wheat crops on new land that was brought into production. For decades farmers had suffered from a market that had been deflated by overproduction, and regulation seemed to hold out hope for improved profits. Through 1933 McCarthy had argued that frequent meetings with her constituents convinced her that they broadly supported federal intervention in agriculture.15 But by late 1934 that support had begun to erode as farmers felt AAA programs were bureaucratic and intrusive. By 1936, the Supreme Court had ruled the AAA unconstitutional. McCarthy sailed through the Democratic primary unopposed. In the general election she faced Frank Carlson, Landon’s handpicked challenger, who had been the governor’s 1932 campaign manager and chaired the Kansas Republican Party. Carlson effectively turned the election into a referendum to endorse or to repudiate the New Deal programs.18 McCarthy defended the federal programs and ran on her record as a friend of farmers. Public opinion, however, had already shifted. In late October, Kansas livestock producers voted against a proposal to limit corn and hog production—one of the first revolts against the AAA legislation. McCarthy’s claims that most farmers supported the administration’s policies were substantially weakened.19 In a close campaign, Carlson edged out McCarthy, winning by a margin of 2,796 votes out of more than nearly 123,000 cast, or 51 percent of the vote. 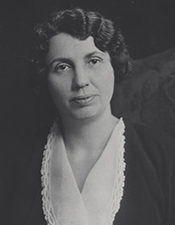 After leaving Congress, McCarthy returned to her law practice in Hays and to attend to the businesses once managed by her father, who passed away in the summer of 1933.20 In 1937, she led a reform effort to stop the wholesale practice of sterilizing young girls at state correctional facilities.21 She paid the tuition for dozens of low–income students to attend Fort Hays State University, including several African Americans to whom she also extended free room and board in her home.22 In 1940 and 1944, McCarthy attended the Democratic National Conventions as a Kansas delegate.23 On January 16, 1952, she passed away in Hays, Kansas, after an extended illness. 1Frances Mangum, “Congresswoman McCarthy Says a Word–About Cupid,” 17 January 1934, Washington Post: 15. 2“Kathryn McCarthy Much Entertained,” 12 March 1933, Washington Post: S2. 4For motivations, see Hope Chamberlin, A Minority of Members: Women in the U.S. Congress (New York: Praeger, 1973): 101–102; Susan Tolchin, Women in Congress (Washington, D.C.: Government Printing Office, 1976): 53. 7Chamberlin, A Minority of Members: 101. 8W.G. Clugston, “Kansas Wheat Men See Hope in Barley,” 18 December 1932, New York Times: E6. 9“Legal Beer Is Speeded,” 15 March 1933, New York Times: 1. 10Congressional Record, House, 73rd Cong., 1st sess. (14 March 1933): 394. 11Congressional Record, House, 73rd Cong., 2nd sess. (26 April 1934): 7468–7469. 12Congressional Record, House, 73rd Cong., 2nd sess. (23 May 1934): 9390–9391. 13Congressional Record, House, 73rd Cong., 2nd sess. (1 March 1934): 3529–3530. 14Congressional Record, House, 73rd Cong., 1st sess. (12 April 1933): 1613. 15Congressional Record, House, 73rd Cong., 1st sess. (21 March 1933): 687–688. 16Raymond Clapper, “Warns Bureaucracy AAA Grows,” 12 June 1934, Washington Post: 2. 17Congressional Record, House, 73rd Cong., 2nd sess. (18 June 1934): 1934–1935. 18Roy Buckingham, “Republicans Start NRA Row in Kansas,” 24 June 1934, New York Times: E6. For more on Landon’s position on farm relief, see Donald R. McCoy, Landon of Kansas (Lincoln: University of Nebraska Press, 1966): 144–149; 197–201. 19Roy Buckingham, “Kansans Opposed to Regimentation,” 14 October 1934, New York Times: E1. 20“John O’Loughlin Dies From Heart Disease,” 3 July 1933, Washington Post: 9. 21“Kansas Puts Stop to Sterilizing of Industrial School Children,” 24 October 1937, Washington Post: 1. 22Bobbie Athon, “The First Kansas Congresswoman: Kathryn O’Loughlin McCarthy,” Kansas Historical Society, March 2001, online at http://www.kshs.org/features/feat301.html (accessed 3 September 2003). 23Chamberlin, A Minority of Members: 102. Papers: 1900-1948, quantity unknown. The papers of Kathryn O'Loughlin include announcements of graduations, engagements, and weddings; papers and a scrapbook pertaining to her term in the U.S. House of Representatives, 1933-35; materials on Kansas Frontier Historical Park ("Fort Hays Frontier Park") (now Fort Hays State Historic Site) (Kan.), Fort Hays Kansas State College (now Fort Hays State University) (Hays, Kan.), corporate farming, and sterilization of inmates at the State Industrial School for Girls (now Beloit Juvenile Correctional Facility) (Beloit, Kan.); and a scrapbook of her wedding to Daniel M. McCarthy. A finding aid is available in the repository. Microfilm: 1900-1948, 1 reel. The microfilm is for the papers of Kathryn O'Loughlin at the Ellis County Historical Society. A finding aid is available in the microfilm. "Kathryn O'Loughlin McCarthy" in Women in Congress, 1917-2006. Prepared under the direction of the Committee on House Administration by the Office of History & Preservation, U.S. House of Representatives. Washington: Government Printing Office, 2006.